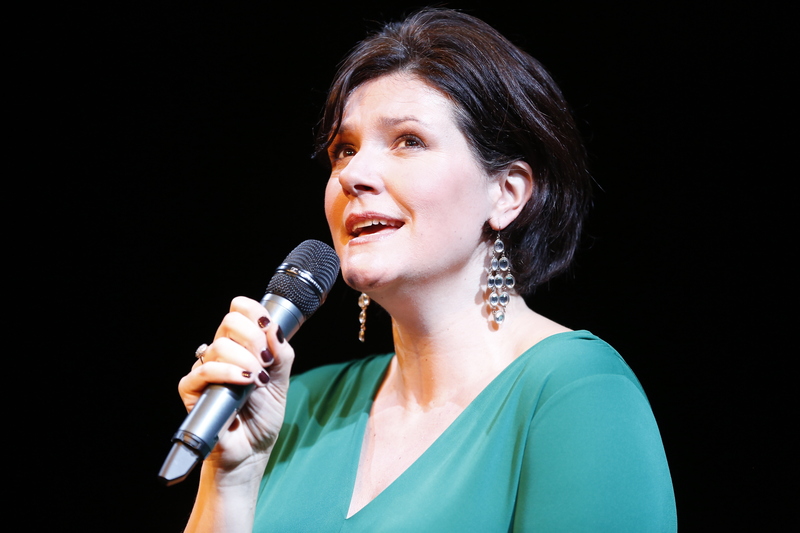 An end-of-year musical treasure I discovered this past weekend is Beware of Young Girls: Kate Dimbleby Sings the Dory Previn Story, now playing at 59E59 Theaters. Created and performed by Kate Dimbleby, written with Amy Rosenthal, and directed by Cal McCrystal, this fascinating musical journey is the story of the woman who has been called, “Queen of the 1970’s confessional songwriters.” While Dory was less well known than her prolific composer husband, Andre Previn, if hers was a contemporary story of our own day, it would undoubtedly be splashed across the tabloids and featured on Entertainment Tonight with all the lurid details of Andre leaving her for the much younger, Mia Farrow. Perhaps that betrayal was an important source for what would become Dory Previn’s own impressive songbook full of heartbreak and longing in tunes that would be picked up by such stars as Doris Day, Frank Sinatra, Rosemary Clooney and Tony Bennett. Slim and sleek in elegantly sequined dark slacks, matching jacket and soft white blouse, Miss Dimbleby brought warmth and mystery to the unusual opening number, “Mythical Kings and Iguanas,” the title tune from Dory Previn’s most successful album. With sparkling eyes and a confident air, she was at once a gently compelling storyteller. 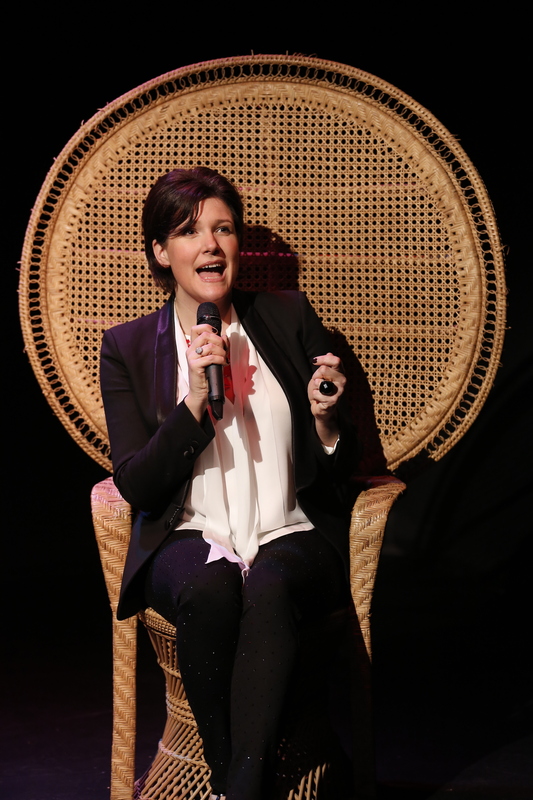 As she narrates the tale of Miss Previn, her crisp and clear enunciation was reminiscent of Julie Andrews. We learn of Dory’s sometimes-distant father in the song, “My Daddy Says I Ain’t His Child”, but he later encouraged his child star’s efforts in dance and song. We see ambition take hold with the song, “You’re Gonna Hear From Me.” Soon young Dory’s knack for song writing lands her in Hollywood. There’s an early look at her dark side in the black comedy of the song, “Mary C. Brown and the Hollywood Sign.” It was based on the true story of a troubled girl who committed suicide by jumping to her death from the famous landmark. Reflecting on the sign with disillusionment, the song spoofs that Hollywood welcome with a parody of Emma Lazarus’ words on the Statue of Liberty using lyrics like, “ Give me your poor and maladjusted…your black-listed…” etc. Throughout the performance, related slide projections appear high on the back wall, and before the show ends there are more songs and biographical details for those lucky enough to attend remaining performances. Dory settles in the Hudson Valley with final husband, artist Joby Baker. But the frantic pace of her life has one last hurrah as the audience finds itself joining the hand-clapping reprise of, “Twenty Mile Zone.” Speed your way to the theater for this fascinating gem. 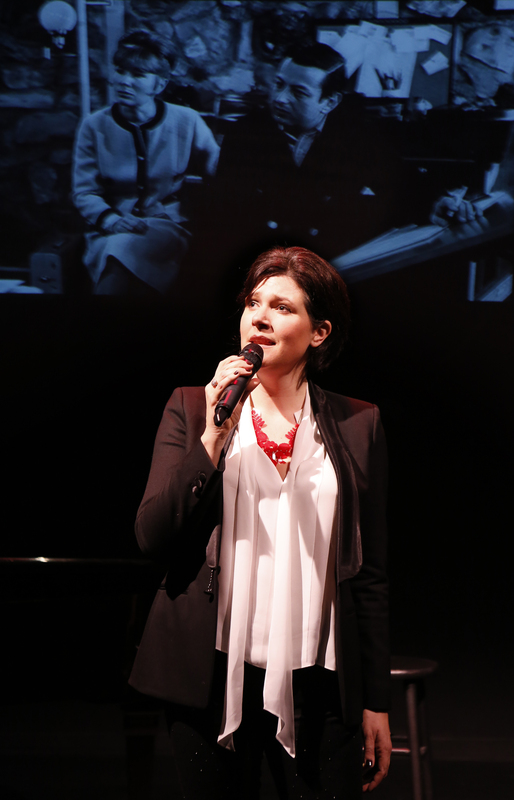 BEWARE OF YOUNG GIRLS: KATE DIMBLEBY SINGS THE DORY PREVIN STORY continues this limited engagement through January 4, 2015 at the 59E59 Theaters (59 East 59th Street, between Madison and Park Avenues). The performance schedule is Tuesday – Thursday at 7:15 PM; Friday at 8:15 PM; Saturday at 5:15 PM & 8:15 PM; and Sunday at 3:15 PM & 7:15 PM. Please note, there is no performance on December 25; the performances on December 24 and December 31 are at 6:15 PM. Tickets are $35 ($24.50 for 59E59 Members). To purchase tickets, call Ticket Central at (212) 279-4200 or go to www.59e59.org. This entry was posted in 59E59 Theaters, Andre Previn, BEWARE OF YOUNG GIRLS, BroadwayStars.com, Concert Reviews, Dory Previn, Kate Dimbleby, Mia Farrow, Off Broadway, Theater Reviews, ThePeoplesCritic.com and tagged 59E59 Theaters, Andre Previn, Beware of Young Girls, concerts, Dory Previn, Kate Dimbleby, Mia Farrow, musicals, New York, theatre. Bookmark the permalink. Sounds like a really good show and you must have worked really hard to get it done by midnight!